Dr. Eleith Brown began her career as a very successful teacher, but concern for her students’ oral health and their lack of dental hygiene education motivated her to make a life-altering change. The Robert Wood Johnson Foundation (RWJF) Health Policy Fellows program provides the nation’s most comprehensive fellowship experience at the nexus of health science, policy and politics in Washington, D.C.
ADEA recognizes achievement and distinction among its members through its awards program offered in conjunction with ADEA's corporate partners. 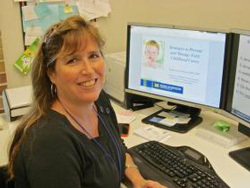 The University of Michigan School of Dentistry (U-M SOD) will join forces with three other Michigan-based organizations in an effort to develop a comprehensive interprofessional program to reduce the burden of childhood dental disease in Michigan. The National Institutes of Health (NIH) has released three new funding opportunity announcements (FOAs) to develop approaches to engage researchers and prepare them to thrive in NIH-funded research careers. The University of New England (UNE) has appointed James B. Hanley, D.M.D., as the new Dean of the College of Dental Medicine, effective April 1, 2014. Are you a dental or dental hygiene student interested in becoming an educator or researcher? Applications are due by Friday, December 13. The American Association of Public Health Dentistry (AAPHD) Foundation is accepting applications for the Herschel S. Horowitz Scholarship.